Landmark curved Grade II listed building which has been transformed to give it a new lease of life. RIBA Award Winner 2009. Bovis Lend Lease and Stanhope joined forces with architects KPF and Pringle Brandon to transform Unilever House. Their partnership refurbished the historic building, with construction work completed early in 2007. The first stage of the project involved the demolition, removal and recycling of much of the original building, followed by the restoration of the listed façades and the construction of modern and open spaces for the company. 95 per cent of materials and equipment from carpet tiles to light fittings were recycled, united by the common goal of Reduce, Recycle, Reuse. The site office and restaurant were furnished with the desks, shelving and kitchen from the original Unilever House and much of the furniture and equipment was donated to local London schools and charities. Up to 5000m² of original parquet flooring was re-used and over 6000 tonnes of steel and 17000m³ of concrete were removed during deconstruction and recycled. Construction materials were sourced locally wherever possible and timber purchased for the project from sustainable managed sources. 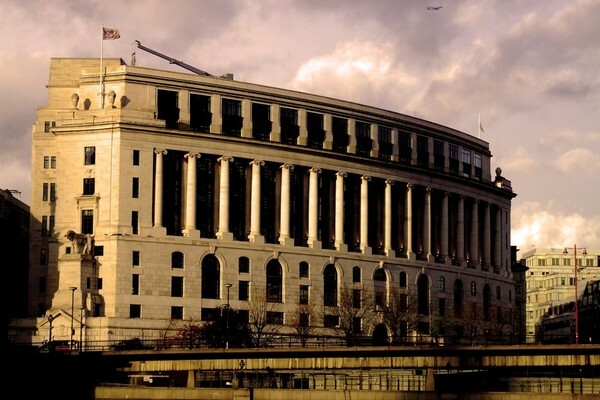 The overall goal set by Unilever was to transform their workplace and their exposure to the public whilst keeping the best from the past, including their historic ties to the site and the building they commissioned in the 1920s. The existing main crescent elevation and northern Watergate elevation were retained, restored and refurbished where necessary. The existing structure running parallel behind these two elevations was retained and extended to form more modern, deep office floors. The narrow back wing forming three small light wells was removed to create a single atrium. The west elevation was entirely replaced and treated to reduce its visual impact. Where possible plant and miscellaneous clutter was removed from the roof and new plant confined to the basement. The top floor roof areas were transformed into the meeting, social and catering spaces formerly located at ground and basement levels. The Watergate elevation was opened up at ground level and the interior immediately adjacent remodelled as a double height hall accessible from the outside. This allowed a stronger visual and access link than existed previously between the busy Watergate and the building interior. The original front door was re-opened as the office front door for all tenants, and the 1930s Thames Room interior refurbished and extended as part of a new entrance hall. The basic shape of the atrium is created by the inner edges of the office floor plates running behind the crescent and Watergate façades. The atrium wall is vertical along the crescent, but steps over inwards from the fifth to seventh floors of the Watergate Wing to compensate for the external set backs. The atrium wall design maximises the amount of openness and daylight entering the offices space with predominantly glazed walls. However, the aesthetic of the space is not ‘high tech’ but more the inheritor of the 1930s modernist tradition. Young British artist Conrad Shawcross was commissioned to produce an artwork for the new atrium by Unilever and Stanhope in consultation with Andersen O’Day Fine Art. The massive sculpture is programmed to make a small rotation on two planes daily until, over 60 days, it completes a full cycle, enlivening the vast eight-storey atrium space for those working in and visiting the building.